John comes from a family where music was a ‘way of life’. John’s father was organist and choirmaster at the chapel. JOHN comes from a family where music was a ‘way of life’. He was first introduced to choral music as a young boy when he was taken, along with his two brothers, to Wesley Place Church, Ingrow, to listen to such oratorios as the Messiah, Elijah and The Creation. John’s father was organist and choirmaster at the chapel. 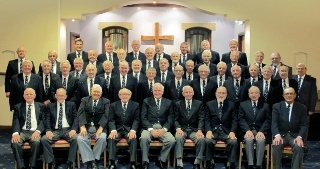 Singing, for John, began at Steeton Methodist Church where he was a member of the choir. It was to be from here that John, his brothers Frank and David, together with three friends, formed their Sextet. The Sextet sang largely unaccompanied and became well known locally for their wide range of songs (they even performed on Radio Leeds!). At 17 John joined the Keighley Vocal Union under the baton of his farther, singing at many festivals from the local Keighley Summerscales to the famous Llangollen Eisteddford. John’s introduction to conducting began in 1976 and, after some early nerves, has him given great pleasure. His obvious love and understanding of music has inspired and encouraged all those under his leadership. In the words of one of those members ‘he has the ability to make the words come to life, and to send tingles of pleasure down your spine’. John’s last concert with us was in Wilsden on the 20th May 2017. KEN - was born in Leeds, but quickly realising his mistake insisted, at 18 months of age, that the family move to Huddersfield, a town with a long established choral tradition. From the age of 8 he dutifully attended piano lessons at 9.00 a.m. each Saturday morning, and it was not long before he was appointed to the position of Hon. Pianist at Dalton St. Paul’s Methodist Sunday School. In his teens he played for a local teacher of singing, obtaining a thorough grounding in the art of accompanying, and the more important art of trying to guess what on earth the singer is going to do next! In a distinguished amateur career he played for Male Voice Choirs, Ladies’ Choirs, Girls’ Choir, Childrens’ Choir, Amateur Operatic Societies, a Dance Band, and numerous solo artistes. Sadly, Ken died suddenly on the 12th May 2017, on the day before his farewell party. In a distinguished amateur career he played for many types of groups.